Bryde’s Whales (Balaenoptera brydei) are the least known and in many ways the most unusual of the rorquals. Bryde’s whales are small by rorqual standards and weigh no more than about 25 tons although it is larger than the Minke and very streamlined. Male Bryde’s usually measure around 12 – 14 metres in length and females 13 – 15 metres. 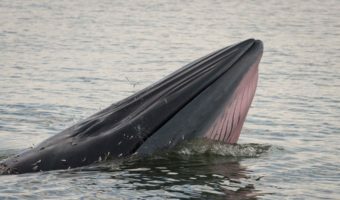 Bryde’s whales often show their heads when at the surface of the water, where it is possible to distinguish three ridges that go along from the blow hole to the point. The dorsal fin on the Bryde’s whale is quite large and falcated (curved back). Their spout is narrow and high. It has the tendency to arch its back deeply. Bryde’s Whales have a very broad and short head, with between 40 and 70 ventral grooves and relatively large eyes. According to International Fund for Animal Welfare, the mammal has folds or grooves on its throat and chest that allow the mouth to expand when filled with water. The whale has twin blowholes with a low splashguard to the front. It has no teeth but has two rows of baleen plates. Their flippers are small and slender, their broad, centrally notched tail flukes never break the surface. 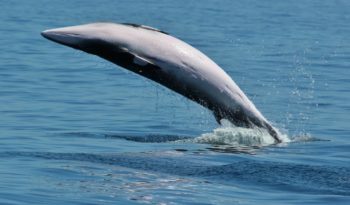 The Bryde’s whales back is generally dark grey or blue to black, the ventral area a lighter cream, shading to greyish purple on the belly. 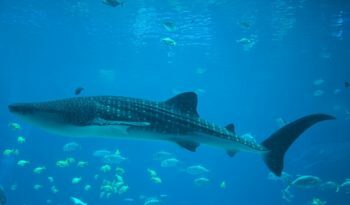 Some have a number of whitish-grey spots, which may be scars from parasites or shark attacks. The Bryde’s whales prefer tropical and temperate waters to the polar seas that other whales in their family prefer. They are largely coastal rather than pelagic and although they retain the characteristic plates of whalebone that the baleen whales use to sieve small creatures from the waters, their diet is composed almost entirely of fish. Bryde’s whales are believed to breed year round and their gestation period is estimated to be 12 months. Calves are about 4 metres long at birth and weigh 1,000 kilograms. Brydes whales conservation status has not been evaluated. They are listed as Data Deficient by the International Union for the Conservation of Nature and Natural Resources (IUCN). They are also listed on Conservation on International Trade of Endangered Species of Wild Fauna and Flora (CITES) Appendix I, which prohibits international trade.